Southwest Border Apprehensions Show Small Decline In January Government data reflect a slight dip in arrests even as authorities see more Central American families trying to enter the U.S.
Migrants line up after being apprehended along the U.S.-Mexico border near Lukeville, Ariz. Mexico is at the top of the image, beyond the border fence. 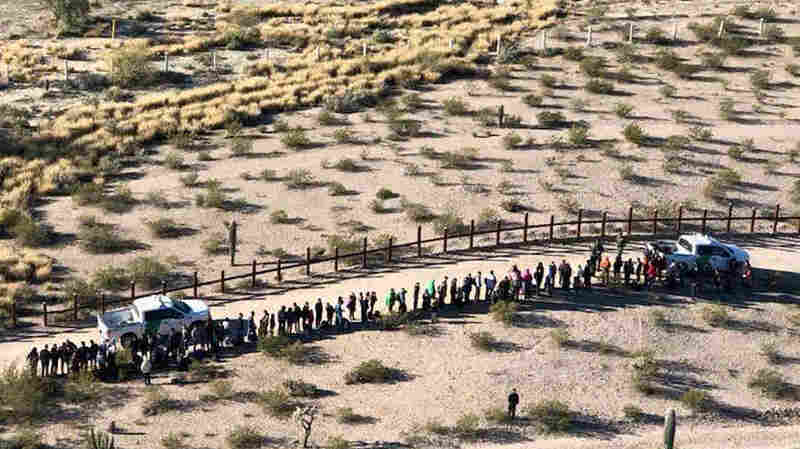 New government figures released Friday show that the U.S. Border Patrol arrested or denied entry to 58,207 individuals in January 2019, a 4 percent decrease from 60,779 in December 2018. Yet it is still a 62 percent increase from a year ago when 35,905 people were arrested or denied entry. The slight decline since last month is in keeping with seasonal patterns when fewer migrants attempt to cross the border during winter months. However, U.S. Customs and Border Protection, in a statement, says it is still seeing a "high volume of families and unaccompanied children from Central America are attempting to cross the Southwest border." "Large groups of 100 or more people, many of which are families from Central America, are increasingly crossing the border illegally in remote areas. As of January, U.S. Border Patrol (USBP) agents encountered 58 large groups so far this year compared to 13 during this same period in Fiscal Year (FY) 2018." For example, a group of 325 Central Americans turned themselves in on Thursday near Lukeville, Ariz., said the CBP in a separate statement. "The group consisted of individuals and family units from Central America and included nearly 150 juveniles, 32 of whom were unaccompanied," it said. The statement said that the group included two juveniles who needed hospital treatment. CBP's policy towards migrant children has come under scrutiny since the deaths of two minors in U.S. custody in late 2018.